Feb1 by Steven Birchfield A.M.A. In Part I some important testimonies were established. 1.) A testimony concerning the length of the rule for the period of the current president. 2.) The testimony concerning the theme of change for the country from the revolution of the Year in Aries. 3.) The testimony concerning the very poor state of the general populace and how that state is the cause of the ruler’s state. Now because the angles of the Revolution of the World Year in Aries were in common signs and the Lord of the Ascendant was in a common sign, then especially there is yet one important revolution of this year; i.e. the Libra Ingress. And falling in the Aries Ingress just prior to the Libra Ingress is a conjunction of Mars/Saturn which had a special signification to political events. The second is proper to the sum of the parts of those universal , like the property of the indicators of the conjunction of the two malefics in Cancer, and the conjunction of the two superior in each of the signs, for the condition of chiefs among leaders and nobles in that transit. Again we need to return to the principles of Saturn and Mars. I looked at these two planets to determine the length of a rulers rule. And once again we can say that when they join they are going to indicate what changes can occur to rulers and their rule. Historically they indicated rebellions and upheavals in politics. Which is why the worst case scenario of Mars/Saturn conjunctions was when their conjunction fell in Cancer because Cancer is the fall of Mars and detriment of Saturn; both are very malefic in this sign generally speaking. But Rebellions don’t have to always be violent. When a majority decide enough is enough they can cause a revolution. Mind you revolutions just mean turning and going the other way. And in modern western countries for the most part these revolutions are done at the ballot box. The call word of every opposing candidate seems to be “change”. What is it we want to understand from this chart? Particularly, this chart will tell us the nature of the conjunction’s indication from the planet which has predominance over the principal positions. In other words, what kinds of change are in the works? Will the change be violent? Will it be generally a good and useful or bad and failed change? What is the nature of the change? What are the principle positions? 1) The Ascendant 2) Lord of the Ascendant 3) Degree of the conjunction 4) Lord of the Conjunction and 5) the chart luminary. Now based on the number of testimonies in these places and the strength of that testimony then no other planet but Mars would qualify as the predominant planet. And the day and hour rulers (Moon and Mercury) testify to Mars and Venus (nocturnal benefic) confers her testimony to Mars. So what can we say about the nature of the conjunctions indication? It will be the nature of Mars in his preferred domicile and in sect. Change, confrontation and conflict are principle natures and being in sect and in his strength then those states of being will be productive, with Mars very violent nature being mitigated and moderate. Having judged the nature of its indication then we have to see where this conjunction falls in the Revolution of the World Year in Aries. We immediately see that the conjunction occurs in the place of the Moon in the Ingress chart. The Moon of course is general significator of the common people. And this is the 3rd house which in mundane astrology signifies the practice of the laws and religion as well as the consideration of matters in the practice of doctrine and law and faith. It was seen as the house of “opinion and fighting amongst sects concerning doctrine and law”. It is the 7th from 9th and signifies partners, conflicts and contentions of religious men and law makers. So I say then, that “change” is coming because of the harm falling on the common people; because of arguments and unjust imprisonment and bonds; damages and afflictions from unjust practice of the law; the ruin of villages and towns and the forced migration of their people, and the lack of resources. All of which are ultimately destroying the people’s wealth and livelihoods. The testimony that is being strengthened in these current considerations is that “change” and “rebellion” if you will, is a strong motivation of the common people. 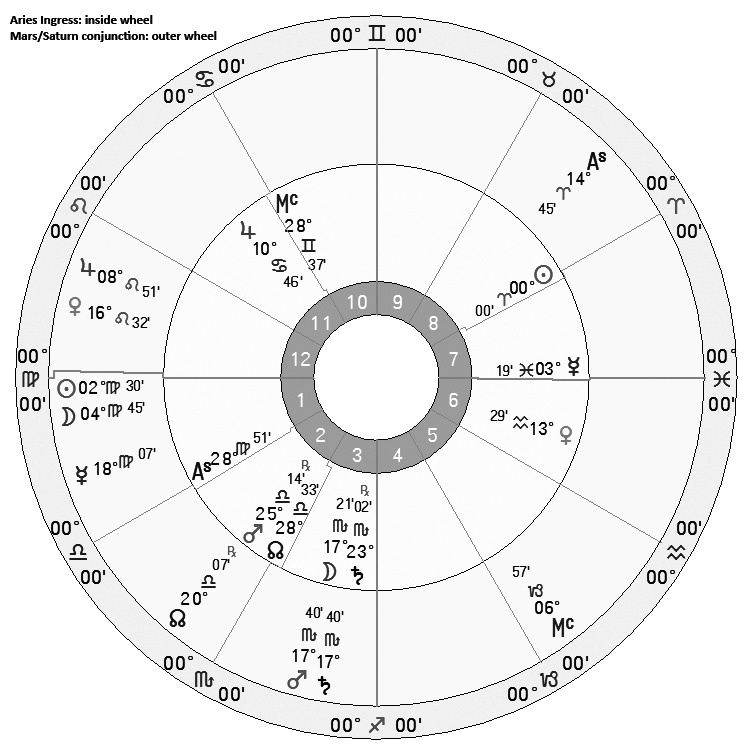 The next chart and the one most relevant to the election is the chart of the Libra Ingress for 2014 as the election will be held in this half of the year. Therefore we are told that the LOY of this chart will participate in the significations that began in the Aries Ingress. I judge that the LOY of this revolution is the Moon because she is the nocturnal triplicity ruler of the Ascendant and is in the Ascendant and is the chart luminary. She is also Lady of the Day and the Hour. Mercury falls in aversion to his domicile and exaltation. There is no other planet as worthy to be the LOY. I judge that in this chart the significator of the current ruler is Venus since the Midheaven falls in Taurus and she sees her domicile from the Ascendant. In this chart we can now look at the significator of the opposition and the rulers’ opponent. 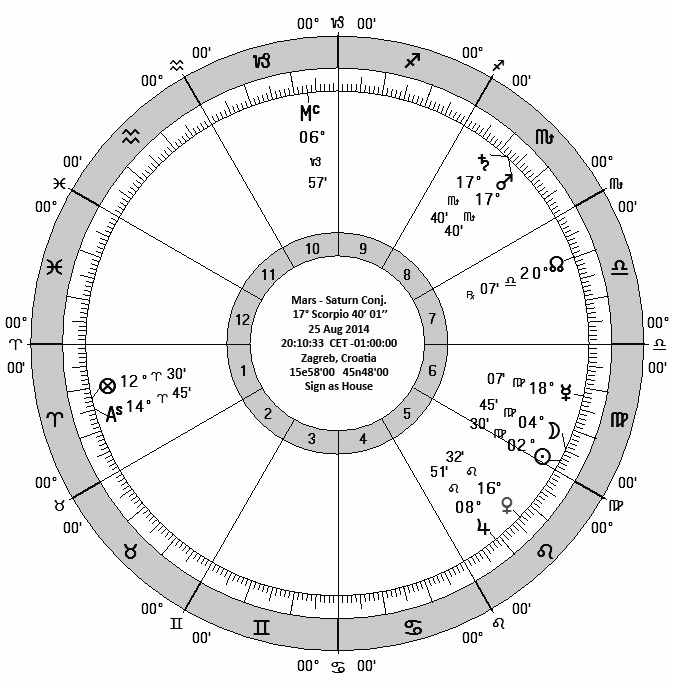 Scorpio is the sign on the IC but its ruler Mars falls in aversion. I judge that Saturn found in Scorpio is the opposition ruler. I also find this supports the major political parties involved; the more liberal social democrat/left wing parties (Venus) and the conservative centre-right parties (Saturn). At first glance it would seem that the LOY is joining Venus except that Saturn casts his ray to 19° Virgo and cuts off the Moons joining with Venus. This is, in my opinion, the clearest testimony that the people give their testimony and power to the opposition instead of the current ruler. I find it significant that Saturn is aspected by this very intense Jupiter, in its nocturnal triplicity, rising oriental of the Sun and superior to Saturn in the 10th from Saturn. I also find it interesting that Jupiter is in Saturn’s triplicity and bounds and in the house of Saturn’s joy! 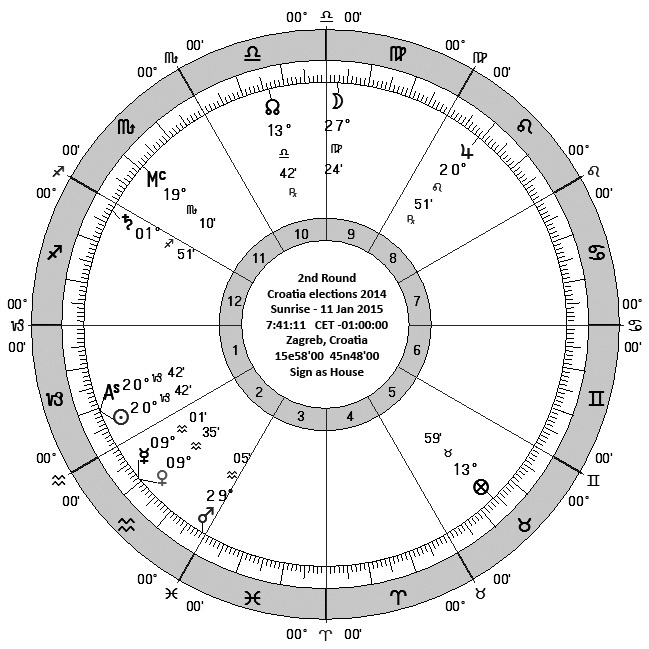 This last chart I am going to consider is the sunrise chart on the day of the election. The reason I am choosing this particular time for the election is because in our astrological lore, sunrise and sunset were the two times ancient astrologers would look at the heavens for portents. When I look at this chart what struck me first is the heliacal rising of Saturn. In the Libra Ingress this I judged was the significator of the opposition so to see it is very significant. I also note that before this day is done the LOY, which is the Moon, will first conjoin with Saturn from Saturn’s exaltation and she confers her testimony to him and he receives it. Judgment is about understanding the testimony from several indicators. I have made my judgments based on many different indicators and charts. The preponderance of testimony tells me that there will be a new President in Croatia. Kolinda Grabar-Kitarović will be the next (and first woman) President of Croatia. Aristotle described two types of political revolution: 1.) Complete change from one system to another; 2.) Modification of an existing system. The Oxford dictionary states that a revolution is: The overthrow of an established order which will involve the transfer of state power from one leadership to another. So a revolution can simply be the removal and replacement of a government and its leaders. Of course the revolutions that stand out in history are those that were violent and sweeping. However the whole idea behind a democracy was to establish a means whereby the people could bring about “revolution” without the bloodshed and total anarchy often following such upheavals. Unfortunately in today’s democracies, they only give the appearance of bringing revolution and change. In most cases the faces change but the powers remain the same. Interestingly Rhetorius places Banks in the 3rd. “The third house is called the house of the Moon, Goddess, overshadowed, authoritative, [and] metacosmic. It signifies the topic of foreign things, that of dreams and religious observation, and banking and friends and brothers and the Queen.” Cf “Rhetorius the Egyptian” Translated from the Greek by James H. Holden and published by American Federation of Astrologers Inc. I would imagine what is meant is “money lenders” since at that time in history there was no institution known as a bank. We find these significations in many medieval astrologers in delineating the houses in mundane astrology such as Saul, Abu Ma’shār and Ibn Ezra. I.e. 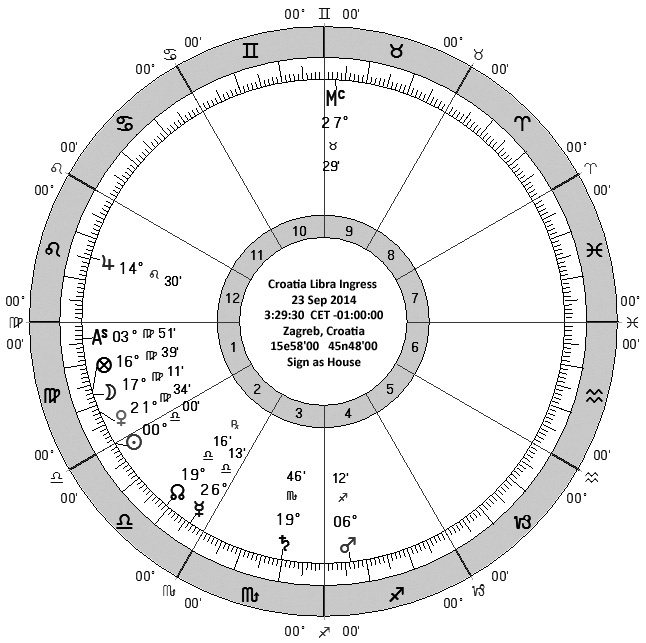 the significations of the Moon joined to Saturn in the Ingress chart. This entry was posted in Uncategorized and tagged conjunction.